Having a business strategy is important but if you don’t have a mental strategy, it can and will make your personal and professional life unnecessary difficult. The way we think and speak can hold us back in so many ways. Today I would like to introduce a very simple mental strategy. I encourage you to eliminate “I have to” from your vocabulary. 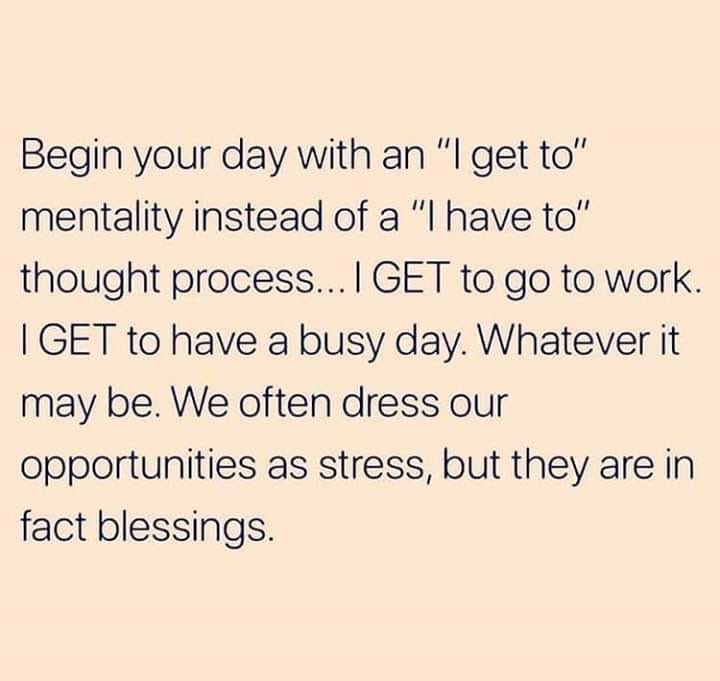 Replace it with “I get to” and notice the difference this will make. I have to go to work – how about “I get to go to work” and I am grateful that I have a job. I have to cook dinner – how about “I get to cook dinner” and I am grateful for the people at my dinner table. I have to do laundry – how about “I get to do laundry” and I am grateful that I have a washing machine. I have to pick up the kids from school – how about “I get to pick up the kids from school” and I am grateful to be blessed with children. I have to go to the operations’ meeting – how about “I get to go to the operations’ meeting” and I am grateful that I have a spot at that table. I have to travel for business to…… – how about “I get to travel for business to … ” and I am grateful for the opportunity to add value. Get into the habit of counting your blessings instead of creating stress by the way you speak. I get to write daily messages for YOU and I am grateful for the opportunity to educate, inform and inspire. Now don’t wait another minute and “get to” it.